Su recorrido comenzará con la recogida en el hotel de su guía en el área de Waikiki. Al llegar al Diamond Head State Park, comience el emocionante ascenso a la cima de la cima de 760 pies (228 metros) del cráter Diamond Head. A medida que avanza, su guía analizará la historia, la flora, la fauna y la geología del cráter, y señalará las diversas especies de plantas y aves que se encuentran en el área. ¡Entonces, experimenta impresionantes vistas de 360 grados en la parte superior! Toma fotos y disfruta de los paisajes de Waikiki y del Océano Pacífico turquesa. Se proporcionará todo el equipo y, para celebrar su éxito al final, se le entregará un certificado personalizado "I Climbed Diamond Head". Greg, the tour guide was really great. His knowledge and humor made the trip fun and exciting. He is a big asset to your company. We gave him a 5 star rating. Of the many adventures I've had on Oahu, this was one of the best: for the money it was a terrific value, and the hike itself is beautiful, rewarding, and not too difficult for most. Our leader Ken was hilarious but professional, and did a great job of taking us around. I would definitely do this one again next time. I had a wonderful experience on this tour. 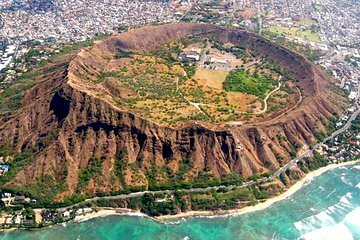 My aunt and I wanted to climb Diamond Head and I thought it would be fun to book a tour where we can hear about Nature and some background in Hawaiian history. Monique did not disappoint. She was very knowledgeable and set a pace for us going up that accommodated everyone in our party. I highly recommend this tour! What an amazing tour for such a small price. The view from the top was amazing. The guide gave us great overview of the history and the geology of the place and the hike was very enjoyable. If you are able to hike, this is a must! I recommend going in the morning before it gets too hot. Great hike, not too taxing, with gorgeous views from the top! Our guide/driver Ken was top notch! He stopped for breaks and pointed out things for us to see. Very knowledgeable and personable!! We highly recommend this tour!! Excellent tour! Our tour guide, Tori, was extremely friendly and was an excellent tour guide! This tour was great because it picked us up/dropped us off from/at our hotel, took us to the crater, and then our guide only guided us up part of the way to a couple check points, leaving us free to climb up to the top and travel back down at our at our own pace. Overall, a great tour! Great tour to do with a guide. Frequent stops on the way up to rest and to hear some of the history of Hawaii. Independent time to explore at the top and take pictures as well. Do the tour in the morning, there is not a lot of shade on the walkway. 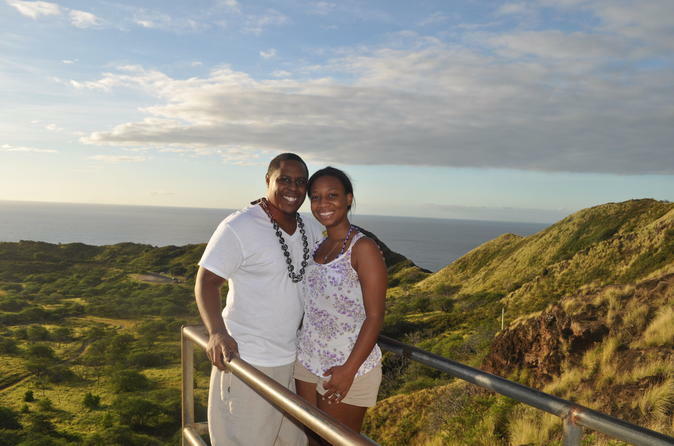 The best pics from our trip were from Diamond Head! The climb was very challenging but we'll worth it!